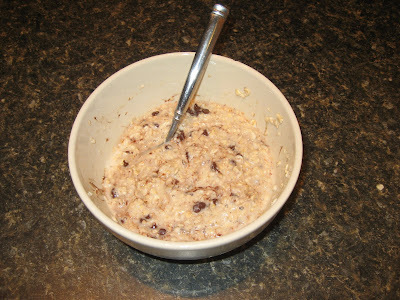 This recipe is not healthy, but it does contain oats which are good for nursing Mamas! Its really not even a recipe just a bunch of things thrown together that make an awesome bowl of oatmeal that I think tastes just like a cookie! Place desired amount of oats and milk in bowl and microwave for 1.5 minutes. Stir in a big spoonful of brown sugar and pour in a dribble of vanilla. Mix together then top with mini chocolate chips. Yum!